Today I made a card for the SCS Color Challenge (CC373 - wild wasabi, pumpkin pie, bashful blue). I had a lot of fun with these colors! I created an outdoor scene with a tree swing, picket fence, grass and flowers, using a step card so that I could have lots of depth between layers. My jumping off point was the picket fence die that I just got from Poppy Stamps - love their dies!! This card was not hard to make, but it was a little time consuming making all the flowers. I have been following Pam Sparks' blog "Expressions with Heart" for a little while now and just love her style and how she creates fun scenes. I'm learning a lot from her and she inspired me to make today's card - thanks Pam!! Hope you like. I made a step card base with Wild Wasabi cardstock (4 1/4" square with the folds at the front being 1" deep) - start with a piece of 4 1/4" x 10 1/2" cardstock. I stamped the tree and swing in StazOn black onto Whisper White cardstock. I made a randomly scalloped border (hand-cut) and used it to sponge clouds in the sky with Bashful Blue ink. I used my blender pen to color in the tree trunk with Soft Suede ink and the leaves and grassy hill with Wild Wasabi ink. I cut the main panel to a 4 1/4" square and then glued a strip of Wild Wasabi grass along the bottom. I mounted the main panel onto the card base. I cut a strip of Whisper White cardstock 4 1/4" x 2" and sponged it with Wild Wasabi ink and then scored a line down the center and creased it. I placed that over top of the step at the front of the card and glued it down with Tombow glue. 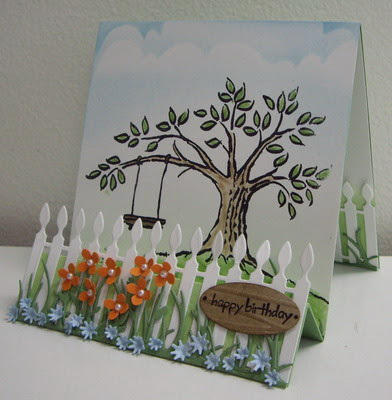 I cut out the picket fence with Whisper White cardstock using my Big Shot. I glued two strips of Wild Wasabi grass (cut out with the big shot) to the front of the picket fence, attaching them at the bottom only. I cut out a set of Wildflowers dies with Wild Wasabi cardstock and then trimmed down the "heads" of the flowers, leaving just a small circle to attached my Pumpkin Pie flower heads to. I punched out the Pumpkin Pie flower heads using the hydrangea punch and shaping them using my mat pack and stylus. I placed a mini half-pearl in the center of each flower. I made eight flowers and then attached them to the picket fence, gluing them just at the bottom. I cut out another set of Wildflowers dies using Bashful Blue cardstock. This time I cut off the stems, just keeping the small flower heads. I shaped each flower with my mat pack and stylus and then glued the small blue flowers all along the bottom of the fence. I had a piece of Crumb Cake embossed with the Forest Branches lying in my scrap pile, so used it for the sentiment. I stamped "happy birthday" in Basic Black ink, punched out a medium oval and then sponged Soft Suede ink on top to highlight the embossing. I added a dot of Early Espresso at each end of the oval to represent "nail heads" and then secured the sign to the picket fence. 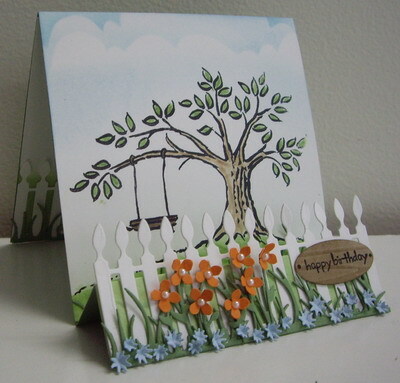 Lastly, I glued the picket fence on top of my card base at the very front. For the inside, I used a Whisper White card panel, sponging Wild Wasabi at the bottom. 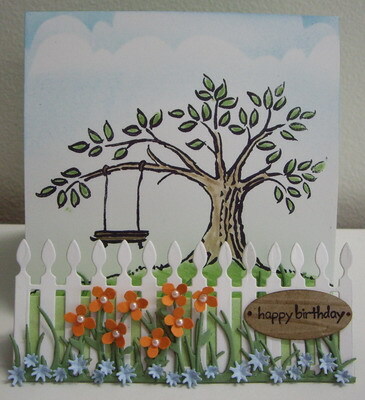 I mounted a picket fence die-cut on top and added a grass die-cut on top of the fence, at the very bottom. Here's a couple of more pictures taken from a different angle so (hopefully) you can see the layers. Labels: birthday, cheery lynn, dry embossing, mixed media, poppy stamps, punch, shaped cards, shaping, stampendous, Stampin' Up! Loll!!! This is awesome! Love it! So pretty...feel like I just stepped outside to a lovely flower garden! Fabulous step card! I hope I have this tree stamp! lol Thanks for sharing! Wow, incredible card, I need to give this a try. I love the scene created with the fold of the card. Thanks for the inspiration. so clean and simple; the best!